Bizerba is the first manufacturer to achieve this world-class standard! Widest product carriage for increased capacity. One piece anodized aluminum construction. Fast and easy to clean, fewer seams, large radii. Improved sealing against water and debris. Largest and easiest to use remnant holder in the industry. Unique design allows for the smallest end pieces, increased product yield. spring-loaded dial insures correct and consistent sharpening. for safety, yield, hygiene, durability, and lowest overall cost of ownership. Low profile – reduces operator fatigue. Largest thumb guard for maximum protection. Zero blade exposure during the cleaning process. One piece carriage with seamless thumb guard for highest hygiene standards. and start at zero (safe-only). Improved liquid and debris diversion from all control surfaces. 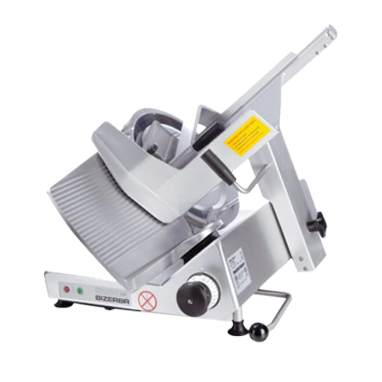 Top quality gravity feed slicer with low-profile carriage for heavy products. Our standard blade is the hardest, thinnest, largest, straightest blade in the industry.